I was born and raised in the dead heat of Arizona, but these days I live in San Francisco, where I am an investigative researcher and activist at the Electronic Frontier Foundation. I'm also a freelance reporter who hasn't been able to shake the habit of committing journalism in San Diego (see "Dave Maass Day" left). With my colleague Kelly Davis, I've been reporting on civil rights abuses in the county's juvenile hall and jail systems since 2012. 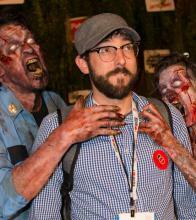 I've also covered San Diego Comic-Con for the last five years, most recently for RollingStone.com. This site is about 50 percent up to date, so please nevermind the duplication, obsolete information and broken links. Contact me with any questions at davemaass [at] gmail.com. You can also follow me on Twitter: @maassive.